The Appalachia forest terrain, typically with sloping hills with over 30 percent slope, lends itself to cable yarder operations. To date, ground-based operations are still the most common harvesting techniques employed, but in some places are no longer acceptable from an environmental point of view. The use of professional helicopter logging crews to access the higher value timber in the more remote areas of the Appalachians has provided local forest managers with an expensive but trouble free “turn-key” solution to their current problems. This paper reviews why there are too few cable-logging contractors that operate successfully in this area. The most common problem is a lack of planning and management expertise and the absence of enough true cable logging contractors with modern equipment. There is considerable opportunity for increased use of this harvesting technique and the newly developed medium sized automated yarder equipment from Europe may present opportunities for providing a cost-effective remedy to the current situation. In the late 1970s and early 1980s a large amount of information was published regarding cable logging in the southern Appalachians. This was a result of increased focus on environmental issues and difficulty reaching second growth timber on steep slopes using conventional ground based logging methods (Gochenour et al., 1978). A variety of cable logging systems were tested in the region and compared for optimum productivity (LeDoux, 1985). Since then, however, there has been considerably less activity in terms of cable logging operation in the region. Helicopter logging has become favourable to many forest land owning companies because they provide a “turn-key” solution. This means that a company that has purchased stumpage will hand over all harvesting aspects to the helicopter logging company, including the felling. This requires little or no on-site management. Cable logging crews have, however, typically been managed in a similar fashion as the ground-based crews, including the need to face issues such as frequent location changes, lack of pre-harvest planning, quotas and truck scheduling problems. This means that most cable logging crews never became “extraction specialists”. The resulting inefficiency meant that cable logging has become too expensive to compete with ground-based operations and too complicated to manage relative to helicopter operations. Considerable innovations are being made in cable logging. Many advances in the industry have the potential to offer increases in productivity and safety over the systems analysed two decades ago. 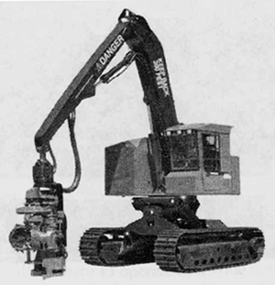 This includes the introduction of steep terrain harvesters for improved cable extraction efficiency and reduced felling costs (Visser and Stampfer, 1998), new systems such as self-propelled carriages and automated yarders (Visser and Pertlik, 1996), and accessory equipment such as radio-controlled chokers. This report analyses the resources available in the Appalachian region suitable for cable logging activities. While planning and experienced personnel for all aspects of cable logging can be seen as critical to the successful development of a cable yarding workforce for the Appalachian region, this report will focus on improving the efficiency of these operations through the introduction of modern equipment and systems. FIA plot data show almost 70 Billion Board Feet (BBF) of timber located on sites with more than 5 MBF acre of saw timber in the central Appalachian mountain region, as shown in Figure 1. We assume 5 MBF acre to be the cutoff for forestland with enough valuable timber to make cable logging justifiable. Just over half of this total (38 BBF) is on slopes over 30 percent (see Figure 2), which is the commonly recommended limitation for ground-based machinery. Furthermore, 17 BBF is on slopes over 50 percent, which represents a reasonable upper limit for even the most modern steep terrain harvester systems. A typical yarder is capable of extracting approximately 2 million board feet a year. Considering the area of land in the slope class greater than 40 percent, and assuming 50 percent of this is actually available for harvest, then a just over 14 BBF will be available for harvest. Converting this to a number of potential yarders to operate in this area, using a 100-year rotation period, the potential for approximately 70 yarders exists. Currently only about 8 yarders are actively working in the region. For the majority of timber conditions in the southern Appalachians, a medium-sized cable yarder (30–40 ft. spar) is the most profitable choice to harvest timber (LeDoux et al., 1995). While a yarder of this size can handle most sawlogs found in the Appalachians, being able to yard conventional 16-foot logs as opposed to tree length material would aid in maximizing payloads. Table 1 shows a summary of productivity studies carried out in the Appalachian region, and includes one additional data set intended to demonstrate the potential benefits of modern cable yarder systems. The Visser and Stampfer (1998) study used a harvester to fell and pre-bunch logs close to the corridor. The other studies used tree-length material unless it was deemed too large for the yarder, in which case it was bucked into 16-foot logs. All of the studies used two choker-setters and had comparable corridor widths. Clearly, the harvester-automated yarder combination system produced the shortest cycle time. 1 This operation used a swing yarder. The swinging phase added to carriage out and carriage in times. 3 A portion of this is waiting for the yarder operator to finish loading before pulling the logs to the landing. The logging industry is continually under pressure to improve safety and productivity. One of the major improvements over the past decade has been increased mechanization, which has taken workers off the ground and put them in machinery (Shaffer and Roberts, 2000). In cable operations, this trend can also be adopted to some extent. In felling of trees, use of steep terrain harvesters equipped with harvester heads allows timber to be felled, delimbed and bucked from the safety of a machine cab. 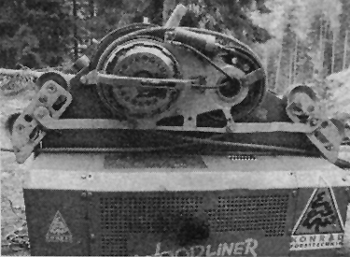 Using a steep terrain harvester, such as shown in Photo 1, it is possible to pre-bunch cut-to-length timber closer to the cable corridor and minimize lateral yarding distances (Visser and Stampfer, 1998). Steep terrain harvesters are being improved constantly, but there are still areas in the Appalachians where they are either not able to cut because of terrain, slope or tree size considerations. On these sites, chainsaw felling may still be the only option. However, the use of a harvester can reduce felling costs through increased productivity and improve extraction by reducing cycle times and increasing average payloads. The new generation of steep terrain harvesters has proven capabilities on up to 50 percent slopes, with some reports of successful felling operations on up to 70 percent slopes. Radio controlled chokers have shown great potential for improved productivity in addition to safety advantages. The use of radio-controlled chokers can eliminate the need for a chaser at the deck and thereby improves safety. The yarder operator can lower the logs to the deck and release the chokers with a remote mounted in the cab of the yarder (Johnson Industries). Depending on the average number of chokers used and the yarding distance, productivity increases of 10–20 percent are possible. In almost all time studies for cable logging operations, the choker setting comprises one of the, if not the, major time component in each cycle. Table 1 shows that unhooking of logs at the deck can comprise up to a full minute of cycle time on the average. In addition, some of the studies listed waiting for the chaser as a major source of operational delays (Huyler and LeDoux, 1997; Biller and Fisher, 1984). Mechanization has started a trend in the Piedmont and coastal plain of the southeastern states towards fewer, large logging companies with multiple crews capable of cutting large acreage quickly. The topography and mixed hardwood timber of the Appalachians has limited that trend somewhat in this region. As a result, smaller logging operations are still relatively common. Self-propelled carriages and automated yarders are two newer cable systems that provide separate benefits of their own. A system that has not received a great deal of attention, but has been used widely in Japan and central Europe is the self-propelled carriage (see Photo 2). These units require either just one or two cables to operate and have internal motors that propel themselves using the skyline itself, or use a secondary driveline. They also have an interior dropline that is radio-controlled and can be lowered by either the choker-setters or the operator at the deck. Although the earlier very large two line models had typical limits of 4 400 lb, most of the carriages in operation today have 2 200 lb capacities (Stampfer et al., 1998). The limited availability of productivity data limits a complete analysis of this system, but a comparison with some medium-sized yarders shows that productivity is somewhat lower (approximately 9 m3 per hour vs. 13 m3 per hour). This lower productivity may be overcome in terms of cost by utilizing a smaller crew and not needing a cable yarder. This system is limited to mostly downhill extraction of cut-to-length logs because of the power in the carriage itself. As a result, a road and suitable landing would need to exist on the downhill side of tracts to harvest them at the lowest costs. Development of better carriages in the future may alleviate this problem. Also, if a winch is utilized, suitable spar trees will be needed at the landing. These limitations, however, should not overshadow the potential for this system for small cable operations in this area. The last development that has true potential for increasing the productivity of cable operations is an “automated” yarder such as the Syncrofalke (Visser and Pertlik, 1996) (see Photo 3). These systems use a computer to control the inhaul and outhaul of the carriage. Outhaul is either to the last location it stopped or to a pre-set distance, and inhaul is automatically set to stop 10 or 20 m from the yarder for safety reasons. Automating the movement of the carriage frees up both the yarder operator and the choker-setters to carry out their tasks while the carriage is in motion. Productivity data from a machine of this sort working with a harvester are presented in Table 1 for Visser and Stampfer. Clearly, this data show the fastest cycle times by far of the systems represented. While the topography description and yarding distances are comparable with all of the studies in Table 1, this operation was carried out in Austria. Another beneficial characteristic of this system is the integration of a knuckle-boom loader on the same trailer as the yarder. Here the yarder operator has controls for both the yarder and the loader in the cab of the machine. While the carriage is in the woods, the operator works the knuckleboom, clearing the chute and sorting logs at the deck. The automated yarder system is more flexible to harvesting conditions than the self-propelled carriages. These yarders have three drums that allow them to operate in a wide array of rigging set-ups. They can also yard up or downhill. The major disadvantage of using this machine is the capital investment trade-off versus the cheaper self-propelled carriages to achieve that added flexibility. There are a number of opportunities for improving the productivity of cable logging operations in the Appalachians. While adoption of entirely new cable logging systems could provide advantages in total productivity or in reduced costs, merely adding new features, such as radio-controlled chokers or cut-to-length harvesters to existing systems, will also provide benefits. Biller, C.J. & Fisher, E.L. 1984. Whole-tree harvesting with a medium capacity cable yarder. Transactions of the ASAE 27(1):2–4. Gochenour, D.L. Jr., Fisher, E.L. & Biller, C.J. 1978. An analytical appraisal of cable logging technique in Appalachia. Forest Industries. 105(11): 80–3. Huyler, N.K., & LeDoux, C.B. 1997. Yarding cost for the Koller K300 cable yarder: results from field trials and simulations. Northern Journal of Applied Forestry. 14(1): 5–9. Johnson Industries Ltd. Radio controlled chokers. LeDoux, C.B. 1985. When is hardwood cable logging economical? Journal of Forestry. 83(5):295–8. LeDoux, C.B., May, D.M., Johnson, T. & Widmann, R.H. 1995. Assessing the feasibility and profitability of cable logging in southern upland hardwood forests. Southern Journal of Applied Forestry. 19(3):97– 102. Shaffer, R.M. & Roberts, T. 2000. Injury rates continue to decline for feller-buncher/grapple skidder operations in the south. Draft FRA Technical Release. 2 pp. Sherar, J.R., Curtin, D.T. & Koger, J.L. 1986. Analysis of the Berger 25Y swing yarder in western North Carolina. Southern Journal of Applied Forestry. 10(4): 197–202. Stampfer, K., Peter Daxner, P. & Rien Visser, R. 1998. An alternative cable system: self-propelled carriages. Liro Forest Solutions Technical Note. TN-46. 3 pp. Visser, R., & Pertlik, E. 1996. “Syncrofalke” automated skyline hauler. Liro Technical Note. TN-24 2 pp. Visser, R.J.M. & Stampfer K. 1998. 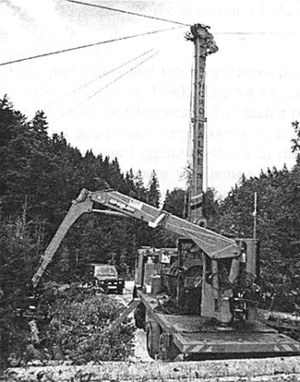 Cable extraction of harvester-felled thinnigs: an Austrian case study. Journal of Forest Engineering. 39–46.